Laurel Lake Retirement Community, a Continuing Care Retirement Community with 488 residents, engaged the design team of Perspectus Architects and Counsilman-Hunsaker to design and implement a multi-phase Center for Healthy Living concept for the 25-year-old community. This recently completed phase includes the expansion of their existing wellness facilities to create a place where residents can retreat from everyday life. Almost double the size of the former facility, the new aquatic center, fitness and spa stands at 11,500 sq. ft. Its calming use of materials and color palette inspires residents to stay healthy, active, and independent. 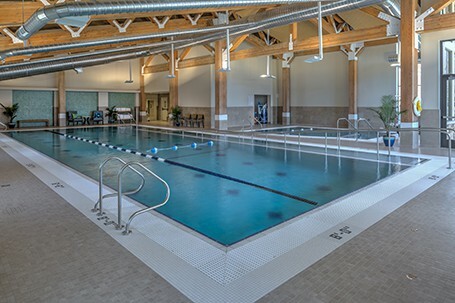 The facility is a welcome addition to a community surrounded by 150 acres of forests, lakes, and wetlands, and includes spaces for relaxing, exercising, and indulging. Nestled within the sanctuary-like setting, the pool structure was conceived as an extension of the natural surroundings. The use of exposed heavy timber structure, along with floor to ceiling windows, creates a lodge-like feeling year-round for its residents. Large, expansive glass on the southeast corner of the structure strategically focuses views from the interior to the center of the courtyard rather than adjacent residential structures. A covered outdoor patio that residents can use for private parties and events links the interior and exterior spaces.